MARCH 2014 — In support of the Boys & Girls Clubs of Greater Kansas City, Garney employee-owners recently attended the 2014 Kids Night Out featuring Academy Award Winning Actor, Al Pacino. This annual event, presented by GEHA the second-largest provider of national health and dental plans serving federal employees, retirees and their families, is pivotal in covering annual operating expenses for the Clubs. Garney’s employee-owners enjoyed a keynote from Pacino, in addition to a live and silent auction, cocktails and dinner. The event, held on March 28 in parallel with National Boys & Girls Club Week, raised funds to support the annual operating budget of five Kansas City Club locations serving nearly 1,000 youth each day. The Boys & Girls Clubs of Greater Kanas City strives to support kids, ages 5-18, develop the skills, values and self-esteem they need to reach their greatest dreams. Explore more about how you can get involved with a Club in your area here. Industrial zone valves, factory equipment. 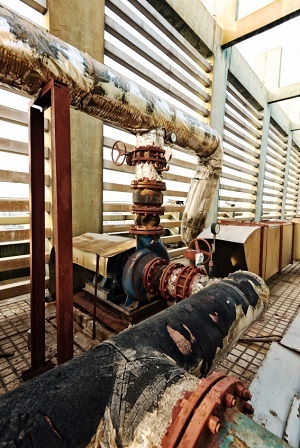 MARCH 2014 — Aging water infrastructure and associated building systems are on the rise; and as a result, have longstanding impacts on the treatment of water imperative to our quality of life. The American Water Works Association (AWWA), in conjunction with likeminded organizations are eager to advance repairs and rehabilitations by lowering the cost of investments for infrastructure projects. The Water Infrastructure Finance and Innovation Authority (WIFIA) concept would aim to do just that. While ensuring a streamlined approach to financing, WIFIA would grant funds from the US Treasury at long-term Treasury rates. Assistance would be offered in the form of low interest loans. The WIFIA concept would be modeled after the success from the transportation industry with TIFIA and would strive to increase the level of investment in water and wastewater infrastructure. Currently, the success of WIFIA remains in the hands of those at Capitol Hill with major support from AWWA and the Association of Metropolitan Water Agencies (AMWA) and the Water Environment Federation (WEF). As many projects often lack aid from State Revolving Funds, WIFIA would offer a drastic change in water infrastructure for communities around the nation. Learn more details about AWWA’s stance on WIFIA and the capability of its tremendous impact here. 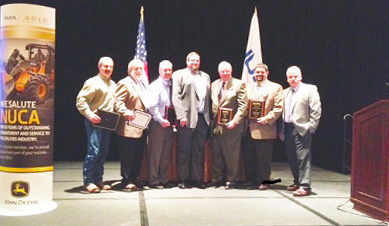 MARCH 2014 — On March 3, Garney received the award as the overall winner for the prestigious 2013 National Utility Contractor Association (NUCA) William H. Feather Safety Award. Of the six different categories broken down by man hours and presented with awards, Garney received the Overall Winner category defined as exceeding one million man hours. This honor recognizes Garney for making the commitment to safety their number one priority. The award was established in 1978, in honor of William H. Feather, one of the founding chairmen of NUCA’s Safety Committee. The award is separated into six categories based upon the total man hours worked for each construction firm. NUCA also takes into consideration the construction firm’s Experience Modification Rate (EMR), incidence rates, safety statements, and safety program implementation. Garney has consistently been far below the industry average for EMR – a remarkable safety achievement in the utility construction industry. Safety is a core value and an integral part of Garney’s culture. Garney’s Health & Safety Program provides their employee-owners with the tools, knowledge and resources needed to safely accomplish their work as well as protect clients, subcontractors and the general public. Prior to the start of all projects, a Job Specific Safety Analysis is prepared to address the hazards and risks of each individual project. A Pre-Job Safety Conference is held with management and key crew leaders to plan an approach to addressing these risks. Every Garney employee-owner is required to adhere to the company’s safety guidelines. From the early planning stages of a project through completion, Garney is committed to being a safety leader in the construction industry. David began his career at Garney as a Project Administrator and worked his way through the ranks to the position of Assistant Project Manager and then General Superintendent. David is responsible for directing all daily activities of employees and subcontractors. He monitors the work performed on projects and controls the quality of all portions of the work. He is currently working as General Superintendent on the Northern Treatment Plant for the Metro Wastewater Reclamation District in Brighton, Colo. David has a good reputation in the industry as being a safety conscious professional, hardworking and demanding, for which he will be a successful and strong leader of the Colorado Chapter of NUCA. DECEMBER 2013 — Garney’s T-Bar Ranch Well Field Development & Delivery Project won a Design-Build Institute of America (DBIA) National Merit Award for 2013. The project will be highlighted at the DBIA National Conference in Las Vegas in November. This project includes the design and installation of 60 miles of 48″ steel and C303 water transmission main and 21 miles of well field piping in just 12 months. To be considered for a National Design-Build Project Award, projects must demonstrate successful application of design-build best practices as defined by DBIA’s Design-Build Manual of Practice. This includes early integration of key team members and close coordination between design and construction team members from the design-development stage through construction. For 2013, DBIA added a section pertaining to team performance. JULY 2013 — Garney’s 2013 preliminary EMR has been issued at 0.53, which is the lowest EMR in our history. An EMR this low is extremely hard to obtain for a company that works in so many states. The more states a company works in, the harder it becomes to drive down the EMR due to the way the NCCI rating formula works. Garney’s ongoing corporate emphasis on safety, spearheaded by Jamie Blystone, Neal Timmons and Ryan Smith, has played a key role in these results. The added focus of the company and our crews on safety has allowed us to lower our accident incident rate, which has a positive impact in helping the company lower its EMR. MAY 2013 — While many businesses in Kansas City are still floundering from a hard year and a difficult economy, Garney Construction has had one of its best years yet. The Kansas City Business Journal has awarded Garney with the Champions of Business award for the second year in a row. Garney acquired Encore Construction, in Winter Park, Fla., in late 2012 and picked up three large projects across the country as well. The company’s total gross revenue for 2012 was $494 million, and they acquired $714 million in new projects from 2012. Garney Construction CEO Mike Heitmann, said the acquisition strengthens Garney’s presence in Florida and expands Garney’s reach to the Carolinas in their east coast region. The new projects Garney will be working on are in Texas and Colorado. In Midland, Texas, Garney Construction will be working to build a $155 million water pipeline. A new $305 million pipeline is also being built northwest of Dallas. Garney will also work with CH2M Hill to design and build a $254 million water treatment plant in Denver, Colo. that is scheduled to be completed in 2015. Garney Construction hopes to continue their success in 2014 and beyond. MARCH 2013 — Encore Construction (acquired by Garney Construction) was selected as a Pyramid winner for the Associated Builders and Contractors’ 2012 Excellence in Construction Awards competition in the Public Works / Environmental – All Contract Amounts category for the Seminole County Regional Water Treatment Facility at Yankee Lake project. This honor recognizes Encore Construction as having one of the most innovative and high quality merit shop construction projects in the country. The Yankee Lake project included the construction of a raw water pump station and intake structure on a canal off of the St. Johns River and treatment facilities. Garney Construction acquired Encore Construction, located in Winter Garden, Florida, in November 2012. DECEMBER 2012 — Garney Holding Company announced its latest expansion with the acquisition of Encore Construction Company, based out of Winter Garden, Florida. Encore is an environmental contractor specializing in the construction of water and wastewater treatment facilities and pump stations. Encore has approximately 125 employees with projected revenues of $80 million for 2012. Acquiring Encore will significantly enhance Garney’s treatment plant construction operations in the Southeastern United States. In addition to Encore’s strong plant capabilities in the Southeast, Garney was attracted to their culture, which closely mimics the strong culture and core values at Garney. Pat Rainey, founder and principal of the company, is planning to retire in the next few years and will be divesting his ownership in the company. Selling his company to Garney interested Pat because of Garney’s employee-ownership structure. This ownership structure gives the Encore employees a great opportunity to obtain a stake in Garney, build a successful career with a leader in the industry, and retire securely. Encore Construction was organized as a Sole Proprietorship in 1984 by founder Patrick T. Rainey. The company initially operated as a concrete foundation firm. Encore took advantage of the construction boom that Disney and other theme parks brought to Central Florida during its first year of operation in 1985. By the end of the year, Encore had 10 full-time employees and was incorporated in the State of Florida. By 1989, Encore had developed a niche in the water and wastewater treatment plant market segment, where the company’s main focus is today. OCTOBER 2012 — In the gas and oil capital of West Texas, a drought couldn’t have come at a worse time. The City of Midland is experiencing a gas and oil boom which is filling hotels, creating a housing market comparable to New York City, occupying offices that have sat empty since the last boom, over-populating schools, and dropping the unemployment rate below 4%. This sudden influx in the economy has Midland running out of water. A city that has historically drawn its water from three nearby reservoirs has seen two dry up completely and the third drop below 12% capacity. With water lacking, Midland faces a dilemma: how do they support a rapidly growing community with a rapidly depleting water source? The solution is to bring groundwater from the T-Bar Ranch 65 miles west of town. In 1965, the City of Midland purchased this ranch, knowing that the Pecos Valley Alluvium flowed beneath the property. Midland County Fresh Water Supply District No. 1 is a local water district with a bonding capacity of $475 million to supply water to Texas communities. Garney Construction, along with Black & Veatch, formed a consortium as the General Contractor. Garney is responsible for installing nearly 500,000 LF of pipe, constructing a 5 MG elevated water tower, and other small structures. Black & Veatch, along with Garney Construction, formed a consortium as the General Contractor. Black & Veatch is responsible for the design of 60 miles of the 48” transmission main as well as the high service pump station. Overland Contracting is the construction entity of Black & Veatch, constructing the wells, ground storage tank at the well field, intermediate ground storage tank, and terminus facility. Parkhill Smith and Cooper is the Design Engineer responsible for designing the wells, well field collection piping, ground storage tanks, elevated water tower, and five miles of the 48” transmission main. Hilliard Energy is a key player in acquiring the needed right-of-way for the pipeline to bring the water from the T-Bar Ranch to Midland. Southwest Water Company holds the responsibility of operating and maintaining the T-Bar pipeline for the next 40 years. Well Field Collection System: The well field sits on the T-Bar Ranch and will be comprised of 40 to 45 production wells, a 2 MG ground storage tank, and a high service pump station. The wells vary from 350 to 700 feet deep and will produce between 250 and 650 gallons per minute. The 22 miles of well field collection piping is primarily PVC pipe, with the exception of the 36” bar wrapped C303 trunk pipeline. The high service pump station is designed to push 20 million gallons of water a day to Midland. Transmission Main: This pipeline is 60 miles long consisting of both 48” steel pipe and 48” bar wrapped C303 pipe. The first 25 miles of the line gradually climbs 500 feet in elevation to the top of the cap rock north of Notrees, Texas. Atop the cap rock will sit a 2 MG ground storage tank and the site for a future twin tank for expansion of the line. From the intermediate tank site, the 48” transmission main is gravity fed 35 miles, dropping 500 feet in elevation toward Midland, where a pressure reducing terminus facility will be constructed and the 191 Extension project begins. The pipeline has been designed to bring as much as 38 MGD to Midland with the future expansion of the well field, tanks and facilities. The pipe material is being supplied by three different pipe suppliers: Hanson Pressure Pipe, Northwest Pipe, and Ameron International, all of with whom Garney has strong relationships. 191 Extension Project: On the same site as the terminus structure, the 191 Extension Project begins with a 5 MG elevated water tower and a chlorination facility. From the water tower, an additional five miles of 48” bar wrapped pipe will be installed and will tie directly into the City’s water system. In addition, approximately eight miles of 16” PVC distribution pipe will be installed. This extension project is being designed by Parkhill Smith and Cooper, constructed by Garney, and will ultimately be owned, operated and maintained by the City of Midland. Right-of-Way Acquisition: The need to acquire 65 miles of easement across private land while on an extremely condensed schedule provided quite a challenge, but Hilliard Energy got the job done. The important task at hand for the remainder of the project is building and maintaining relationships with the landowners to ensure a smooth delivery of the project. Rock Trenching: With more than 35 miles of the project being solid caliche, Garney has subcontracted with one of the top trenching firms in the country. TekRock has mobilized five trenchers to the project in order to keep up with the aggressive schedule. Of these five trenchers, two of them are Trencor 1860 HDs, the world’s largest trencher. Tunnel Bores: With the transmission main traversing three counties, the project will require 13 tunnel bores under state and county highways. Design: Due to the transmission main winding through the heart of three major oil fields, the design was critical. To have the project designed under the time crunch is a testament to the high quality team that was assembled. Maximizing on the Design-Build Method: While the design-build process allows for a project to be designed and constructed more quickly than traditional design-bid-build, this project had to be completed at an even faster pace than the design-build method typically allows. To meet the needs of this project, ingenuity and teamwork was required from everyone involved. Resources: In order for Garney to construct this project on time, nine crews and more than 50 pieces of equipment have been brought in from all over the country to make it happen. The project is currently underway and is projected to be completed by May 2013.